Jan Hus, Jerome of Prague and Orthodoxy in Czechia & Slovakia — 1389 Blog - Counterjihad! An interview with Metropolitan Christopher, Archbishop of Prague and Metropolitan of the Czech and Slovakian lands. Archbishop Christopher of Prague, Metropolitan of the Czech and Slovakian lands talks about the history and modern condition of the Orthodox Church in Czechia and Slovakia. The talk was recorded in June of 2011. —Your Beatitude, you chose the path of a clergyman of the Orthodox Church during the time in Czechoslovakia after the famous events of 1968 (“Prague Spring”), and for a number of reasons thousands of parishioners were leaving the Orthodox Church. To be Orthodox at that time was at the least, not considered prestigious. What moved you to go against the current? —Yes, that was when my fate was decided: I chose the Orthodox theological seminary. I have to admit that it was not my cherished dream to become a priest. I wanted to become a forest ranger, and I also wanted very much to paint icons. I studied iconography with Fr. Andrei (Kolomatsky), a very gifted Russian priest, architect, artist, and tireless man of prayer. At times I would try to paint, wanting my icons to be like his—alive. But it didn’t come out like that. I would complain to Fr. Andrei, and he would answer, “Are you praying?” He himself prayed without ceasing, and that was the most important thing I learned from him. I began my spiritual path with him, and I came to know the mighty power of prayer, the strength of Orthodoxy, which enables a man, hoping in God’s help, to overcome what would seem to be insurmountable. I came to know God’s mercy, how the Lord works miracles. Perhaps it was then that I first had the desire to become a priest, albeit not fully consciously. I went to the seminary only because no other school of higher education would have accepted me. At the time, in order to be accepted at an institute, one had to fill in an application line about one’s agreement to enter the armed forces of the Warsaw convention on my country’s territory. I was not in agreement with violence. Never. When I heard that in the application for admission to the seminary at the Orthodox theological department of Charles University had no such requirement (but there is, as they told me, a more complicated question—on Holy Scripture), I applied there. This is how, by God’s will, I began my path as a clergyman. —The Church of Czechoslovakia is currently preparing for the sixty-year anniversary of its autocephaly. Why did the Church of Czechoslovakia receive its autocephaly from the Russian Orthodox Church? —The first contacts, which became the basis of the friendship between our Churches, go back to antiquity, in the tenth–eleventh centuries, when the recluse Procopius, like St. Sergius of Radonezh, founded a monastery in the forest wilderness not far from the Sázava river, which later became a large, famous monastery. During the time that the Sázava Monastery was active, the monks would go to Kiev, and the monks from Kievan Russia would visit the Sázava Monastery. Each time they would bring gifts of icons and manuscripts to each other… These gifts from the Sázava Monastery are still treasured in Kiev. The Kiev monks in their turn brought a piece of the relics of Sts. Boris and Gleb to the Sázava Monastery, where they were honored with great reverence. One of the monastery’s side altars was dedicated to these saints. Russians helped the Czechs afterward, also. They sent money for the construction of Orthodox Churches, and Orthodox priests. One of these was, for example, the martyr for Orthodoxy and faithfulness to Slavicism Archpriest Nicholai Ryzhkov. The people of Czechia honor that man’s memory. The Czechs also received Russian refugees (during the years of the civil war in Russia and subsequent persecutions) as their own brothers. They helped them to establish themselves, to receive education… The young Czech government spent billions on that. The Russian Orthodox Church did much for the Orthodox in Czechia also after the war. During those years, on the territory of the Czech and Slovak lands their existed four jurisdictions. It was necessary to do away with this atomism of the Orthodox Church and place our reliance in the largest Orthodox Church, the Russian Church. In 1946, the Czech Orthodox Church was accepted into the Moscow Patriarchate. The Russian Orthodox Church sent a talented organizer and missionary to Prague, a most honorable man who suffered much, Bishop Eleutherius. He had a gift of preaching from God, and drew to Orthodox tens, later hundreds of thousands of parishioners. In 1950 the Church of Czechoslovakia already had a sufficient number of the faithful and bishops to receive independence. It even had a theology school. The Church could support and maintain itself, and needed no support from other sources. On November 23, 1951, a statement was signed in the Moscow Patriarchate granting autocephaly to the Czechoslovakian Orthodox Church. From December 18, 1951, after the notification of the heads of the Autocephalous Orthodox Churches of Czechoslovakia, the Orthodox Church exists as an autocephaly. —During the 1950′s, the Russian Orthodox Church endured a new round of persecutions (the Khrushchev era). In Czechoslovakia, upper echelons of the Communist Party aided the Orthodox Church in a victory over the Uniates. Is it true that this act of the Communists aided Orthodoxy in Czechia and Slovakia? —What was the real reason for the mass exit of parishioners from the Orthodox Church after the events of 1968? —Is it true that at the present time, only the Orthodox Church of the Czech lands and Slovakia is increasing in the number of parishioners, while all other confessions are decreasing? What is the reason for this, in your opinion? —Yes, this is true. The number of Orthodox in Czechia is growing. Many people have come to us from the former Soviet Union. They want to live here. And they bring their homeland with them—the Orthodox Church. But Czechs are also coming to be baptized into Orthodoxy. Our Church attracts people by the absence of negative phenomena in its history—that is, the inquisition and persecution of those of different convictions. To the contrary, the Orthodox Church is a refuge for all the persecuted. That there are many more Orthodox can be seen: all the Orthodox churches are full. On feast days we even have to serve outdoors, next to the church. Meanwhile, the many Catholic churches are empty; at best, concerts are given in them. The Uniate churches are also not at all full. Less than a tenth of the original number of parishioners (in the 1920′s there were 900,000!) are left in the Hussite Church. Around three million parishioners have left the Catholic Church. —Why is this happening? Why is Czechia the most atheistic country in Europe? —People ask me about this often. I then answer by telling the history of my much-suffering country, which joyfully received Baptism from the saintly brothers Cyril and Methodius, but later, after many centuries, suffered persecution from the aggressive (at that time) Roman popes and cardinals… Catholicism was instituted by force, by almost the same methods as fascists or communists used. For disobedience—requisition of property and land, exile from the country, and even execution… “Let every father, mother, and child who does not receive Catholicism in fourteen years be exiled from the country!” Such were the orders from the Pope of Rome after the Catholic League’s victory over the Czechs. At that time, nearly half of the population of Czechia was exiled. Out of 150,000 families, there remained only 30,000. It is apparently understandable, why Czechs did not like Catholicism. Therefore, as soon as Czechoslovakia became an independent country, nearly a million people left the Catholic Church and created the Czechoslovakian Orthodox Church. And our country would have been Orthodox then, had not, as the Russians say, a mess occurred. Essentially, a tragedy: When the Primate of the newly created Orthodox Church, Holy Hieromartry Gorazd, went to America in order to obtain some needed financial means with the help of wealthy Czechs, another pretender to the bishopric, the talented orator Karel Farsky led nearly all the parishioners into his modernist Church, where Jesus Christ was honored not as the Son of God, but as the First Saint, born of marital union. And people believed him… I think that the name of this modernist Church, called Hussite, worked on people’s psychology. Although, Jan Hus himself was not a modernist, but rather went to be burned at the stake for the sake of Original Church of Christ. As years passed, people have figured everything out. That is the answer to why people leave not only the Catholic Church, but also the Hussite Church. —Czechia is considered to be the most atheist country. It would seem that without faith, all the vices of society should appear. But in fact Czechia is a peaceful country, people are well-wishing, without aggression. One can be out on the streets without fear at any time of the day or night. Everything in Czechia—the construction of houses, the public transportation, the stores, and other places—is designed to be of maximum convenience for people. I remember how amazed I was at the transfer system of the trains… Everywhere, you feel that in everything having to do with relationships to people there is cordiality, warmth, and kind wisdom… Does this mean that it is possible to do without religion, without faith? What is your opinion on this? Yes, it is very unfortunate that the majority of our citizens do not attend Church services. But does that mean that we can do without the Church entirely? No, of course not. It is precisely thanks to the Church that our people had the happiness of receiving Christianity originally from the very Equal-to-the-Apostles Cyril and Methodius; in place of barbaric cruelty, they began to cultivate such qualities as love of neighbor, gentleness, and readiness to forgive offenses; loyalty and dedication to family and Fatherland, honor of parents, and all the other virtues. It is precisely thanks to the Church, to our great patriots, such as the first president of Czechoslovakia Tomáš Garrigue Masaryk, such as the historian and Russophile František Palacký, who were deeply religious men, that our people acquired Christian morals, a Christian view of life. One could say that this very culture instilled by the Church became the Czechs’ second nature. This can also be seen in the mass pilgrimages to holy places and in part through the reverence for Orthodox saints—Martyr Liudmila, Princess of Czechia, and the Holy Passion-Bearer Prince Václav (Wenceslaus). 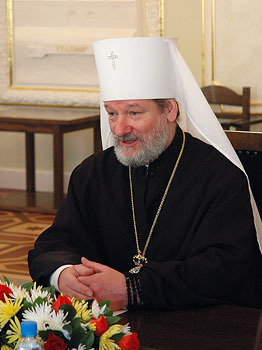 Thus, in answer to your question, I would again like to repeat that it is precisely due to the Christian religion, the Church, which was Orthodox in our country from the beginning, our people have the traditions of their fathers, and became the people you know, and the whole world knows—hard working and peace-loving, with God in their hearts. And, of course, the Czechs need the Church. More and more people in Czechia and Slovakia are giving preference to the Orthodox Church. Nevertheless, it is not our task to increase the number of parishioners from for example, former Catholics. Right now it is necessary to unite our efforts to morally strengthen the people, first of all the young people, in order to teach them how to oppose evil, so that, as they say, the sheep would not become goats. —Will Czechia and Slovakia return to the faith of their fathers, that is, to Orthodoxy? How do you see the future of your Church in the country? I am for the one Church of Saints Cyril and Methodius. Then it will be possible to restore moral values, and raise the peoples’ spirituality. And in this was, is, and always will be the strength of the people and the nation. —Jan Hus and Jerome of Prague died a martyr’s death for Christ’s truth. Their memory lives on not only in Czechia. Your Beatitude, why have they not been canonized as saints? —Czechs began to venerate Jan Hus and Jerome of Prague as saints immediately after they were burned at the stake. Jerome of Prague was the first to call Jan Hus a saint—at the very Council of Constance, which condemned Jan Hus and which awaited a “statement of repentance” and condemnation from Jerome of Jan Hus. They were venerated for two hundred years. However, after the defeat by the Catholic Leagues at the fatal battle on White Hill in 1620 and the forced Catholicization of the Czech people, the names of Jan Hus and Jerome of Prague were basically outlawed. In 1918, when Czechoslovakia became an independent state, the modernist Church took the name of Jan Hus. The communists called him something of a revolutionary. In fact, he never called for modernism in his sermons, but spoke only about the undistorted, original teaching of Jesus Christ, which was in fact Orthodoxy. —Does that mean that Jan Hus’s and Jerome’s martyric deaths could be considered martyrdom for Orthodoxy? —It was precisely of Orthodoxy that they were accused. This was one of the points of accusation of their heresy. However, they considered themselves Catholics and officially were so. Only at the end of the twentieth century did the Primate of the Roman Catholic Church, John Paul II, express his deep regret over their burning at the stake. But he did not go beyond regret. And they both, Jan Hus and Jerome of Prague, died for the undistorted faith, for the pure faith of Christ—that is, for Orthodoxy. Therefore we are completely justified in canonizing them as saints. This has already been confirmed by the Church of Cyprus and the Greek Church. Other Orthodox Churches also support us. —Your Beatitude, what are the greatest problems facing your Church right now? —The greatest problem is the lack of space. Did you see what is going on in the Churches? People can barely squeeze in. Many stand outside. We have nowhere to gather, nowhere to receive pilgrims—and they would come to us. Many people would come from Russia, to the relics of St. Liudmila and St. Wenceslaus; they would come to the place where the first Slavic desert dweller, St. John of Czechia, lived. —It seems you also had a problem with the Sunday school, and with your office? Were you able to resolve them? —Is that your office, Vladyka? —Yes, it was once, and not only mine. Since 1950 this building served as the Metropolitan’s office of all of my predecessors, the Primates of the our Orthodox Church. However, soon after the refusal to extend the lease of the Sunday school, the owner of the building where the Metropolitan’s office is located also refused to extend the lease. The two refusals coincided like that… So during the new school year, the children had to go from place to place. In part, they used the building of a pre-school. —And you yourself remained, as they say, without a roof? —Yes. It was a difficult situation. I am grateful to the Russian Orthodox Church, and in part to His Holiness, Patriarch Kirill of Moscow and All Russia, and also to Metropolitan Hilarion of Volokolamsk, head of the Department of External Church Relations, and the representative of the Russian Orthodox Church here, Archpriest Nicholai Lischeniuk—they helped us very much. Our Sunday school received a non-terminating lease of the building that housed an exhibition complex. True, only part of it; the rest will come in two years. But the Sunday school is already active there. And do you know what is remarkable? The Sunday school is, by God’s will, very near the new Metropolitan’s office. —So, that means that the problem with your office was also resolved? Are you also renting? —We received it as our own property. We purchased it. Again I thank the Russian Orthodox Church, and Patriarch Kirill for his material assistance and support. —Your Beatitude, how is it going with the parcel of land that the government of Prague promised to give you for the construction of such a needed Orthodox Church of the Czech lands and Slovakia, and a Cathedral church? —Tell us, please, about your prospects for the future. About the most important thing. —Our prospects are the young people—they are what is most important. Look at the children in the Sunday school, what bright faces they have. What will they become? Engineers, doctors, teachers, and perhaps priests? We do not know. But undoubtedly they will be people who are able to tell right from wrong, to become citizens who live according to the laws of God. And that is the most important thing. —Finally, one last question concerning the interdependence of Czechs and Russians. You, Your Beatitude, well know what true friendship there was between our peoples. Czechs and Russians have considered each other brothers for many centuries. We loved each other. You also know the reasons for the abrupt cooling, even phobia of the Czechs toward Russians, which, alas, still go on. I know that you for your part try very hard to renew the former friendship. Tell us, please, what specifically do you do in this regard, and what, in your opinion, do Russians need to do in order to make this renewal happen? —Yes, truly, the friendship between Czechs and Russians continued many centuries. [One testimony of this are the huge number of Liudmilas and Viacheslavs (Wenceslaus) found in Russia. —OC.] The events of August 1968 were especially a blow—the Russian invasion in tanks was taken as a crude disregard for our country’s independence. Czechs are particularly sensitive to that. A friends’ betrayal is the bitterest betrayal there can be. Czechs were dumbfounded, and “forgot” the Russian language. I remember myself at that time, and I was only fifteen. It was very bitter to recognize that our very best friends, the Russians, had betrayed us. In August, 1968, on vacation in Hungary, I was arrested for the first time: I had written in Hungarian, “Long live Dubček”. The young Hungarians who told me how to write it in Hungarian gave me away. They were strict about that. They held me and then released me, saying that had I been an adult and Hungarian, I would be sitting in prison for twenty-five years. —Your Beatitude, you said, “the first time.” Was there a second? Now many understand this and relations with Russians have changed for the better. I and the Orthodox priests never tire of repeating that the Russians were and are our brothers. I have been consecrating more and more Russian (Ukrainian)-Czech marriages and baptizing the offspring of these unions—infants born from these bonds of love, and bearing within themselves love for both of our peoples and nations. © 2011, Journey To Orthodoxy | The Orthodox Christian ‘Welcome Home’ Network for Converts. All rights reserved. On republishing this, please provide a link to the original post. Thank you and may God richly bless you. 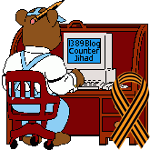 Never Knew that the Church was Orthodox — 1389 Blog - Counterjihad! Next post: The Battle of Kosovo Was Fought in 1389 A.D.